Thieves in central England stole two trailer loads of new engines from the Jaguar Land Rover plant in Solihull, England, this week. According to a report in The Coventry Telegraph, thieves driving a truck were granted access through one of the plant's secured gates late Tuesday. The thieves then drove to an area where engines had been loaded onto trailers. After hooking the trailer to the truck, the driver reappeared at the security gate and showed paperwork to the guard, who let the vehicle leave the plant. JLR builds Range Rover and Land Rover SUVs and the Jaguar XE sedan at the Solihull plant. Later Tuesday or early Wednesday, the thieves returned and repeated the heist, making off with another trailer full of engines. JLR will not say how many or which engines were stolen, but they are valued at 3 million pounds ($3.75 million). 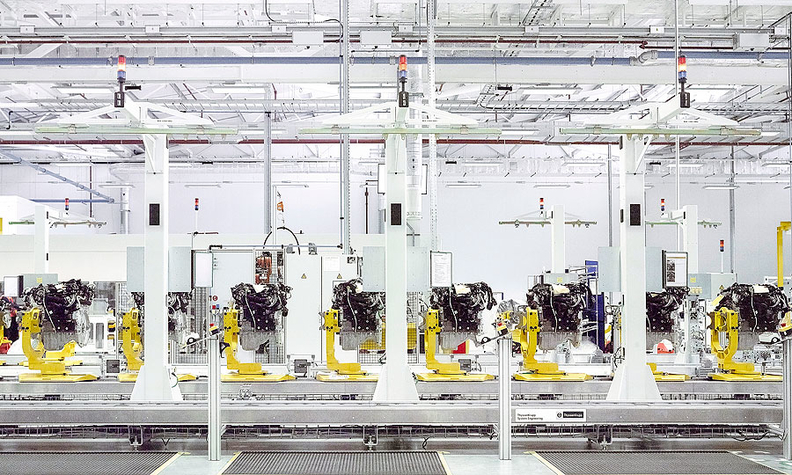 JLR uses V-6 and V-8 gasoline and diesel engines and four-cylinder gasoline and diesel engines. Sources told the Coventry paper the thieves were in and out of the plant in just six minutes each trip. The theft, called "brazen" by British newspapers, stunned JLR managers. An unidentified source told the paper: "About 40 engines can fit in a wagon. The heist had been kept quiet. We believe that only senior security staff and management have known about it, they are shocked at how it has happened. The company pulled in all the managers to a meeting to find out what had gone wrong." JLR is coming off record U.S. sales in January, where both brands set records. The theft of the engines will not impact production, the company says. The stolen engines can't easily be used in other vehicles since they run on proprietary software, and the transmissions that mate to the engines have unique bolt patterns and engineering details. All the engines have serial numbers and would likely to be easy to trace if one ever appeared at a dealership for service. They could potentially be stripped and turned into scrap metal. JLR spokesman Chas Hallet in England told Automotive News Europe sister publication Automotive News that the company is working with West Midlands police, and has offered a reward for information that leads to recovering the engines. Investigators have located the empty trailers used in the theft and have asked for public's help in solving the crime. This week's engine theft was the second such theft. Three years ago, engine thieves targeted JLR’s Solihull plant and drove away with a trailer load of engines worth more than $1.5 million, The Birmingham Mail reported late Friday. But that crime was never made public at the time, the paper said. The thieves were caught and convicted last year; they had planned to dismantle the engines and sell the parts, the paper reported.